Valentines Day didn’t go exactly as planned this year. So we put off making our usual heart-shaped cookies until everyone was well enough to be allowed back into the kitchen. It’s never the wrong day to celebrate with pink heart cookies, I say. I love this recipe for two reasons. First, the dough is extremely easy to work with. 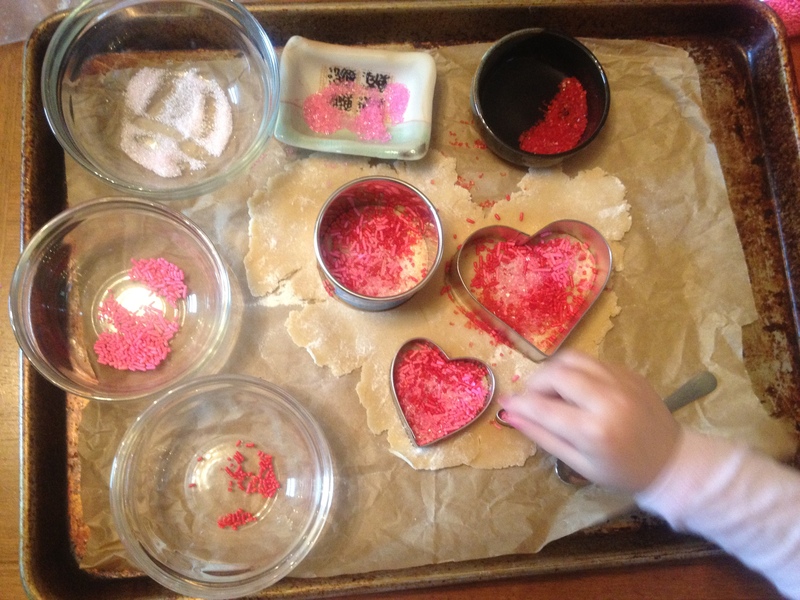 Kids can roll it, cut it, move the cookies, re-roll the scraps, and start again. It isn’t fussy at all. Second, the recipe came to me from my mom’s good friend, who got it from her “Mumsy” decades ago, and you know those recipes are always the best. The recipe came labeled: “A Child’s Cookie: stands up to rough handling by kids.” And indeed it does. Sugar Cookies: Cream 1/2 c. butter with 1 c. sugar. Stir in 2 beaten eggs and 1 tsp. vanilla. Add 2 1/2 c. flour mixed with 2 tsp. baking powder and mix well. Chill dough in refrigerator for 1 hour or up to several days. Roll out to 1/8-1/4″ thick, using a little more flour if the dough is sticky (thicker cookies will be softer, thinner will be crisper). Cut out shapes and bake at 350 on an ungreased cookie sheet. Baking time will vary according to thickness, but start checking them after 6 minutes and remove from oven before they start to brown. Cool on a wire rack. We decorated ours with colored sugar and sprinkles before baking, but of course you can frost these and decorate them once they’re baked. Or leave them plain–you can never go wrong turning plain thin cookies into Nutella Sandwich Cookies. This entry was posted in Cookies, Desserts, Easily Multiplies to Feed a Crowd, Feeding Kids and tagged baking, children, cookies, cooking, dessert, family, food, kids, lifestyle, recipes, Valentines Day on February 20, 2012 by emmycooks. I love these cookies….really pretty! It looks like you guys had so much fun! And the cookies are beautiful! These all look good! Thanks for visiting, and thanks for the Vivace suggestion!